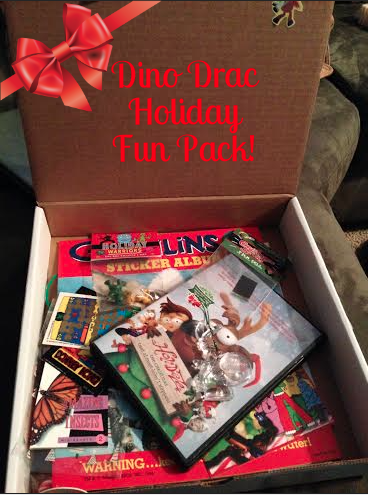 Holiday Dinosaur Dracula Fun Pack! Hoooowdy Hooo! Welcome back to the Holiday Hell Show and today I am unboxing Dinosaur Dracula’s Holiday Fun Pack. What is a Dinosaur Dracula Fun Pack, you ask? Well I will ask, where the hell have you been? The Fun Packs are amazing boxes full of nostalgic delight that Matt puts together and mails to you every month. Lately they have had certain holiday themes because we are in the twilight of the four months which shines over at Dino Drac but it is an ongoing subscription for only $25 a month. Very impressive stuff, too. I don’t know how he does it but as I speak I am looking at an Alien Xenomorph watch and Gremlin flip books from the eighties and lord knows how he found these gems. Each box also comes from a personalized note from Matt with detailed instructions on how to maximize the box to its fullest potential of the goodies. This was something I had to video. I know there have been much better ones made but for the Hell Show, it had to be included. Watch the madness and if you want to (which you should) pop over to his site and subscribe to get one of your very own! New Year And The New Channel! Man, now I regret not getting the December fun pack. As it is, I still need to do a post on the one from last month. That bar is awesome by the way. I’d be lying if I denied being just a bit jealous of it.